Trapped in their town the locals must fight for their lives against a zombie invasion, But there is more to it than they think. One of the perks of doing this blog is getting in-touch with independent film-makers and being able to see their films, their blood, sweat and tears on screen. Some, I must admit, haven't been great but some have been great, "The Zombie King" is definitely the latter. The story focuses around a husband who isn't coping with the loss of his wife, during his grief he turns to the voodoo god of malevolence 'Kalfu' to make a deal to re-unite him with his wife. Whilst we're shown all this going on we're also given the story of the people suffering the consequences of the deal. A milkman, a postman and a traffic warden are in a forest, yes it sounds like the start of a joke but this is the beginning of our film. The introduction of some of our heroes sets the tone for the film, "The Zombie King" is full of dark humour yet it doesn't take away from the actual story, very similar to "Shaun Of The Dead" but darker. Now for those of you hoping for some zombie action should be warned, this isn't that type of film. "The Zombie King" is more of a character driven story with zombies being more in the background. This is actually the first release by Northern Girl Productions which is run by Jennifer Chippindale and Rebecca-Clare Evans who not only star in the movie (more on that later) but also wrote and produced it, you've got to love the work ethic of the indie scene. I'd remember there names if I were you because I see great things ahead for these talented ladies. As the poster says the film features Edward Furlong and Corey Feldman which isn't a bad swoop for your first film, they put in the type of professional performance you'd expect of them. For me this film about the unknowns, as I said earlier Jennifer Chippindale and Rebecca-Clare Evans star as our badass ladies, Jennifer's character (Tara) is more of the quiet type which works very well for her, I would've liked her to say more as she seemed intriguing. Rebecca's character (Danny) is more of the talkative in your face type. The rest of the cast also put in stellar performances, not one character was badly wrote or acted, you can tell a-lot of thought went in-to small details. 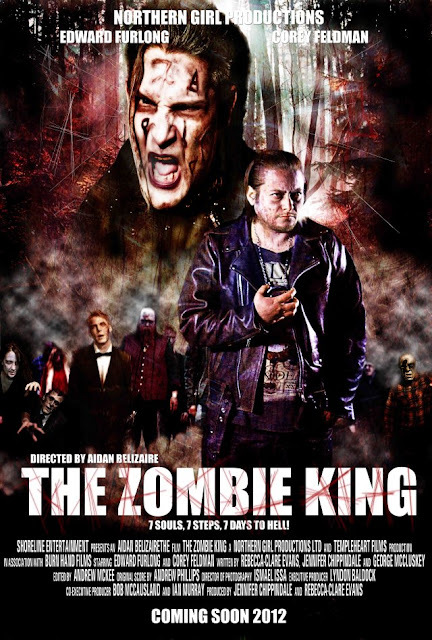 "The Zombie King" maybe a low budget but it doesn't reflect that way on screen, I felt honoured to be able to see this before it's general release. I see this this film becoming a future cult classic and highly recommend you don't let this pass you by! Oh and make sure you keep watching during the credits. This is where I usually post the films trailer, unfortunately "The Zombie King" trailer hasn't been released yet.